In England this legislation began under Henry VII. Henry VIII. 1530: Beggars old and unable to work receive a beggar’s licence. On the other hand, whipping and imprisonment for sturdy vagabonds. They are to be tied to the cart-tail and whipped until the blood streams from their bodies, then to swear an oath to go back to their birthplace or to where they have lived the last three years and to “put themselves to labour.” What grim irony! In 27 Henry VIII. the former statute is repeated, but strengthened with new clauses. 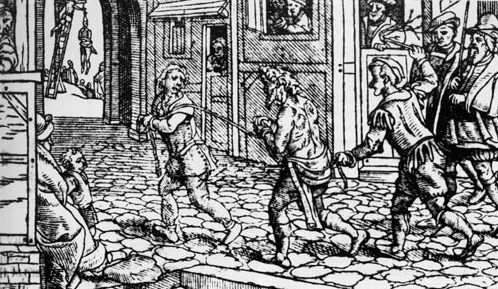 For the second arrest for vagabondage the whipping is to be repeated and half the ear sliced off; but for the third relapse the offender is to be executed as a hardened criminal and enemy of the common weal. Similar laws in France, where by the middle of the 17th century a kingdom of vagabonds (truands) was established in Paris. Even at the beginning of Louis XVI.’s reign (Ordinance of July 13th, 1777) every man in good health from 16 to 60 years of age, if without means of subsistence and not practising a trade, is to be sent to the galleys. Of the same nature are the statute of Charles V. for the Netherlands (October, 1537), the first edict of the States and Towns of Holland (March 10, 1614), the “Plakaat” of the United Provinces (June 26, 1649), &c.
Thus were the agricultural people, first forcibly expropriated from the soil, driven from their homes, turned into vagabonds, and then whipped, branded, tortured by laws grotesquely terrible, into the discipline necessary for the wage system. Excepted from chapter 28 of Capital.